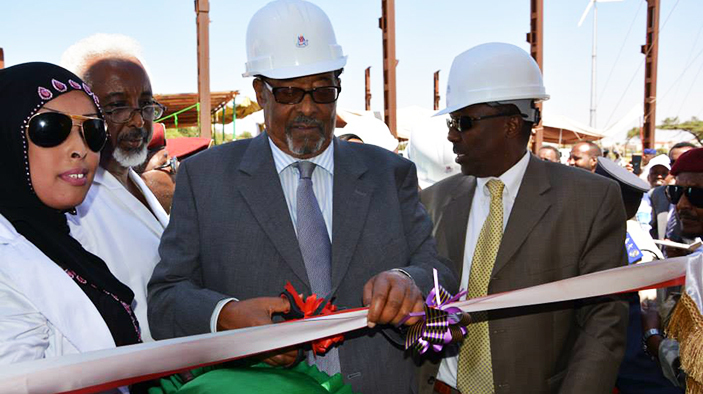 The launch event—attended by Somaliland President Ahmed Mohamed Mohamoud “Silanyo” and several key ministries—was the culmination of activities implemented by the Partnership for Economic Growth, a project funded by the U.S. Agency for International Development (USAID). The collaboration between the government and USAID will run for two and a half years, at which time the wind farm will be fully owned and managed by Somaliland. Golis Energy, a local engineering company supported by USAID, constructed the farm. The wind farm will be operated by Kaah, a local power producer and distributor. The cost of electricity is possibly the largest impediment to economic growth in the Somali region. Local power producers use expensive imported diesel fuel as the only source of energy to generate electricity. Tariff rates are $1 per kilowatt hour—nearly 10 times the cost of electricity in the United States. The high costs have caused the closure of many light manufacturing companies over the past years. When the Partnership for Economic Growth conducted an energy assessment in July 2011, market opportunities for renewable energy became clear. In partnership with the Ministry of Energy, the program supported the development of Somaliland’s first Electrical Energy Law to lay the foundation for the government to provide the technical and oversight capabilities necessary to support a growing wind energy sector. Beginning in 2013, the project helped install wind data monitoring stations in four majors cities to provide real-time wind speed data. With average wind speeds easily exceeding seven to nine meters per second, some estimates suggest that 50 percent of Somaliland has wind speeds suitable for electric energy production. The installation of the five-turbine 100-kilowatt pilot wind farm at Hargeisa’s airport served as a proof-of-concept for potential wind investors. Local capacity was built during the installation process through a training program for managers and engineers from public and private sectors, focusing on wind power construction, maintenance and repair, and budgeting and management of wind power electricity sales. The association recently announced plans to invest in four to seven new wind farms in the coming year.